Vivace is the newest generation of FDA-approved, radio frequency microneedling. This minimally-invasive treatment stimulates the natural production of collagen and is shown to be effective in alleviating facial wrinkles, fine lines, and tightening and toning the face, neck, hands, and body. The Vivace is the only microneedling treatment that boasts a precision robotic motor that minimizes discomfort compared to any other microneedling options. In addition to a powerful and elegant treatment, the Vivace Experience also includes a specially formualted sheet mask and recovery serum to ensure maximum results. Your Vivace results are both immediate and ongoing, so you’ll enjoy instant gratification in addition to long-term improvement. How does the Vivace work? When applied to topically-numbed skin, sterile microneedles are used to create microscopic channels deep into the dermis of the skin. These channels stimulates the body to produce new collagen. During this time, Radio-Frequency energy is delivered to 31x varying depths of penetration to your skin. 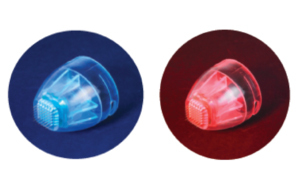 Vivace microneedles are insulated except the end point (0.4mm). 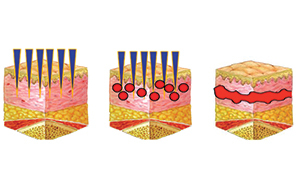 The microneedle electrodes deliver bi-polar energy deep into dermis. Minimally invasive RF thermal-energy creates fractional electrocoagulation in the dermis which facilitates a natural wound-healing process. 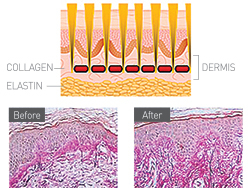 These Wound Healing Mechanisms promote the remodeling of collagen, elastin and wound contraction, which enhances skin laxity. Simultaneous pulses of light activate skin-cells to further increase collagen production, moisture levels in skin, and improve skin tone and texture. The Vivace was designed with your comfort in mind. A topical numbing cream will be applied to your skin 30 to 45 minutes prior to the treatment to ensure as comfortable an experience as possible. Many patient testimonials affirm that the treatment is in a range of comfortable to virtually pain-free. It’s important to work with a trusted provider. Upon their evaluation, they will share their expert opinion about the Vivace is the right treatment to proceed with. Many physicians find three treatments, spaced four to six weeks apart, provide the experience patients are looking for. Single treatment protocols are available depending on results desired. The actual treatment takes about 45-minutes, with an additional 30 to 45 minutes needed for numbing. We recommend you wait at least 24x to 48-hours before you apply makeup. To maximize the results of your Vivace treatment, make sure to apply Soothe Weekly Mask and Soothe Recovery Serum within 4x to 6-hours of treatment. Start with the right device, the right provider, and the right homecare products. Follow the recommended recovery protocols once you get home, which include Soothe Weekly Mask, and the Soothe Recovery Serum. Couple this with abstinence from the sun and three to five days off from working out, and you are well on your way to maximizing The Vivace Experience™ for yourself. Multiple treatments are recommended for optimal results. Your provider may choose to supplement the treatment with serums and recovery protocols that create optimal results and faster recovery. Most patients have very little, to no indication, of any treatment that day.